EnMart is a sponsor of T-Shirt Forums, and a regular on several other forums, including the terrific Apparel Decorators Forum, so I get to see firsthand the questions that people ask about sublimation and printing on garments. One of the questions I see frequently being asked is whether a design can be sublimated on a cotton garment. The answer to that is always no, as sublimation works only with polyester fabric of substrates. Those people who want to print on cotton should not lose hope however, for there is a solution, and its name is ChromaBlast Ink. For those who are unfamiliar with ChromaBlast, the first thing you need to know is that it is not a sublimation ink. ChromaBlast ink uses a patented chemical process which, combined with heat and pressure, set up a cross-link between the cotton fabric, the ink and the media which transfers the image. The end result is a garment that has vibrant color, superior washability and a soft hand. ChromaBlast is like sublimation in that it is easy to create customized cotton items. All you need to do is create your image or design, print your image using ChromaBlast Ink and ChromaBlast paper, and then press your image onto a cotton substrate. Like sublimation ink, ChromaBlast Ink is available for both the Epson and Ricoh printer models, so you can choose the system that best suits your needs. Cotton and cotton blend products will both work well with ChromaBlast ink. You can print on any substrate made of cotton, which makes this an ideal ink for shops that create a lot of corporate apparel. Whether you’re adding a logo to a polo shirt, or creating golf towels for a corporate golf tournament, ChromaBlast will let you customize cotton items exactly as you customer requests. 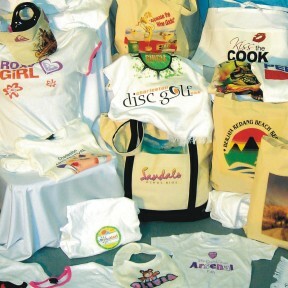 ChromaBlast ink also allows you to offer things like printed monograms on cotton sheets, or personalized tote bags or aprons. If the substrate is cotton, you can use ChromaBlast ink to customize it. If you’re unfamiliar with ChromaBlast, Sawgrass does offer information that will help you get started. You can view a video about applying digital transfers to cotton apparel, or one about applying digital transfers to tote bags. There is also additional technical support information offered on their website. For those who want to see ChromaBlast in action, please visit the EnMart booth at any of the shows at which we exhibit. We have samples of printed cotton garments in the booth, along with ChromaBlast transfers and a ChromaBlast printer. We’ll be happy to discuss ChromaBlast ink and the printing process with you. With the ChromaBlast ink…do you need a seperate printer or can you just swap out cartridges? I have a Ricoh printer for my Sublimation and if I could just change the Sub cartridges to ChromaBlast that would be sweet! We don’t recommend swapping cartridges from one ink to another. The problem is that it’s difficult to get the printer entirely clean, and mixing the inks could cause poor printing. You’d really be better off having one printer for sublimation and one printer for ChromaBlast.